Running a few errands before lunch. Who is this big kid?? Reading books and relaxing before nap. 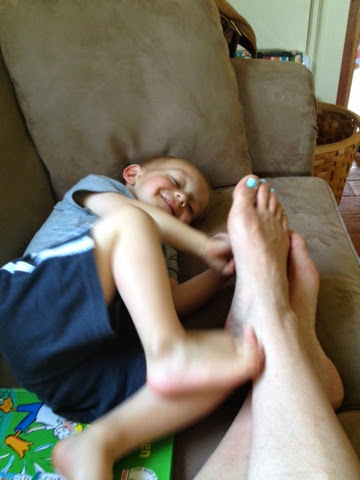 He's saying, "Tickle tickle, Mommy!" Just putting together his farm floor puzzle. 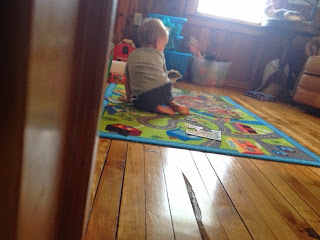 I was not about to interrupt the rarest of occasions when Ayden actually plays alone (and appropriately!) in his play room. I encourage it everyday but he just really loves to have a playmate. He'll play alone in the same room with me while I do my own thing but going upstairs all on his own and playing for a while is just not something he typically enjoys. A few minutes after I snapped that picture I heard him banging on his drum and then playing his harmonica. Then he turned on the demos on his keyboard and came down to get me with his "dancing shoes" on (a pair of dress up cowboy boots). I guess dancing is where he draws the line on going solo. He likes to have a dance partner I suppose. It lasted for about 10 minutes or so but it is a start. A glorious glimpse of what it is like for a child to entertain themselves. I am hoping that he starts doing it more and more and that maybe it will be a normal occurrence by the time Logan gets here. A mama can dream, can't she?? 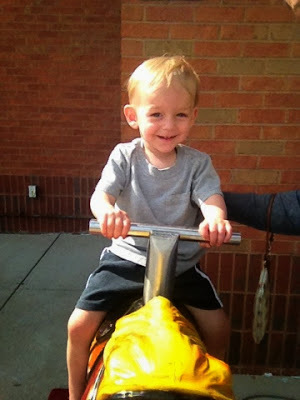 Thank you, Polly, for being the white rabbit for Ayden to follow so he could go enjoy his wonderland all by himself! After our midwife left, Ayden and I headed over to the farm and watered our orchard and checked on the new bees. I need to get an entrance reducer for them because they were having to defend their hive from some pesky caterpillars. The good news is that they were, in fact, defending it. That means that they have decided to call it home (which also means that the queen must have made it in!). The bad news is that they are wasting time and energy on defense rather than pulling comb, raising brood and making HONEY! The bottom board we are using is one we borrowed from my mentor. It is homemade and not quite tall enough to fit the extra entrance reducer that I have. I'll have to go by tomorrow with my gear and stuff some grass and leaves in for now until I can pick up a new bottom board. The joys of beekeeping! Never a dull moment. I did not take my phone out to the farm when we went so I missed a great photo opportunity of Ayden watering all of our trees with the hose. He watered each and every one and did a great job! He looked so cute holding that huge hose and he's seen me do it enough times to where he knew just what to do. We already have a little pro orchardist on our hands! David and I always talk about how neat it will be to see what our kids adopt as their favorite enterprise on the farm. Maybe he really will become our orchardist... Only time will tell. At what age did your children start playing by themselves appropriately? Flashback! Here's what we were up to one year ago today: "May Goals!" And two years ago today: "Daddy, The Baby Whisperer"
Are you religious? The reason I ask is because I have been following your YouTube recipe clips and then discovered your blog and I notice you never mention God or Jesus. Why?? After reading your Easter post I got upset at the commercial aspect of your celebration. I ask myself, why on earth am I even still reading your blog, but as a parent myself, I do enjoy your parenting tips. You rarely respond to your viewers comments which is fine, your busy, I get it. I have tried asking you your religion before too no avail. I would like to know if you are religious, yes or no? If no, I would love to at least introduce you to a website called LDS.org. if you are religious, may I ask what religion you are? You can tell me its non of my bees-wax cuz I know I am overstepping my boundaries, but please don't leave me hanging, at least just answer yes or no. I think its wonderful you are so blessed. Please give thanks to the Lord for what he has blessed you with. Everything we are blessed with is ALL because of the Lord and savior, Jesus Christ. All the sacrifices they made for us. I have seen your comments and appreciate your efforts but I'm not really sure why my religious affiliation is relevant here? All I will say is that I am at complete peace with my beliefs, whatever they may be... I struggle with too much screen and technology time as it is and really like to keep it at a minimum. I realize that commenters like yourself would love prompt replies but to be honest I get on, get my posts published and try to get off as quickly as possible. This is more of a daily diary than a community for me. Even so, I do read and appreciate each and every comment and I respond in bulk when I can; but I can't promise any more than that. It's just the way it is for me during this season in my life. I am grateful each and every day for this life that I live. You are right, I am truly blessed. Thank you for reading and for commenting. Have a great night! Thank you for your comment. I would love to share my testimony with you. I am LDS Mormon and anytime you want to talk about my beliefs or have questions, I am here for you. Please visit LDS.org. if you want LDS missionaries to give you lessons, you can request that on the website to. If you want LDS scriptures to read, The book of Mormon, I can help you get a free book too. The missionaries will also get you one. Please at least think about it. My mom was a convert. She joined the church at 28 all because two sister missionaries knocked on her door several times. She finally gave them a chance and her whole life changed for the better. She later was sealed to her husband and children in temple. This was before I was born. Please, at least visit the website, learn all you can. I am here for your questions. People all over the world are converts to the LDS church everyday. We believe that families are forever and we can be sealed to our loved ones and be with them forever, even after we die. There is so much peace in knowing that. Please, learn of our church. I know its the right thing for your family. I am sorry for being so over bearing, but I feel so passionate about sharing this knowledge with you. Again, thanks for getting back to me. Have a great night. This is a nice testimony and all, but to be honest, this response is why I "left you hanging" before. Just as you probably don't want me to push my differing beliefs on you, please stop pushing yours onto me. I am aware of your religion so there is no need to tell me more. Thank you in advance for respecting my wishes. I respect your wishes. Thank you for getting back to me.